It’s a bit late for the Christmas holidays but a £60,000 win still calls for celebration. 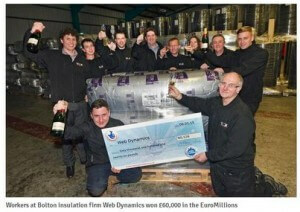 Eighteen workers of the insulation firm Web Dynamics hit it big when one of their tickets for the EuroMillions Lottery managed to match five main numbers in Tuesday’s draw. You can credit persistence for their win, as the EuroMillions syndicate’s leader Bill Clarke says they have been playing the same number combination for eight years. Still his colleagues thought he was playing a joke on them when he announced their good fortune. Each member of the team will pocket £3,340, and manyhave already booked holidays.